On Tuesday, Donald Trump held a rally in Phoenix. As much as the president loves talking at press conferences, he loves his rallies even more, because the crowd goes wild for him. Much of what Trump said during his rally was on his usual themes: He brought up the size of his crowds, the "few" protestors, and the terrible news media. But he also brought Charlottesville back up. Almost two weeks ago, a "Unite the Right" rally was held around a statue of Confederate general Robert E.Lee. The following day, a car drove into a group of counter-protestors, killing a young woman named Heather Heyer. While many loved the response of former president Barack Obama, Trump's left a lot to be desired. 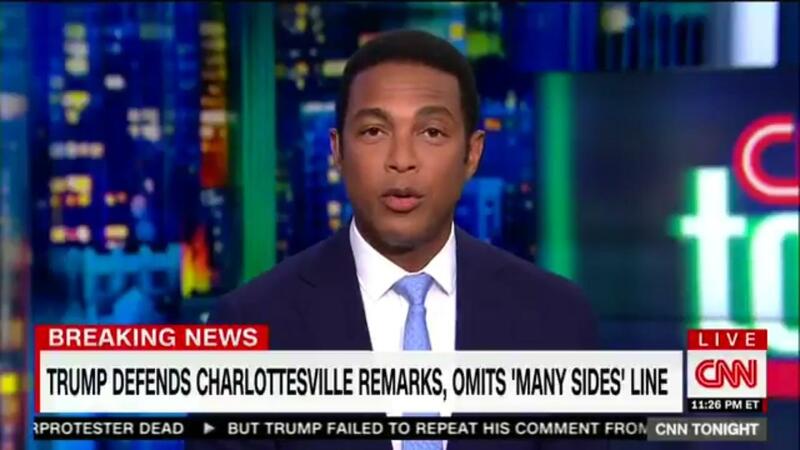 He initially attributed the violence to people on "both sides," then gave a slightly more satisfactory speech admitting Nazis are bad, which was soon followed by a press conference that upset a lot of people, to put it lightly. The backlash was so intense that Trump actually seemed to notice, and during his rally he brought the subject up again, doubling down on his comments about there being bad people on both sides. He also kept mentioning a potential pardon for Sheriff Joe Arpaio, a man who is held in criminal contempt for deliberately targeting Latino people in a well-known racial discrimination case. At this point, it's strange that we continue to be stunned what happens in today's world, but there are still some surprises. For instance, how fed up CNN host Don Lemon is with all this ridiculousness. He starts by saying, "Well, what do you say to that? I am just going to speak from the heart here. What we have witnessed was a total eclipse of the facts." That kind of sounds like a line he practiced, but the emotion behind it is real. "He's unhinged," Lemon continued. "It's embarrassing. And I don't mean for us, the media, because he went after us, but for the country. This is who we elected President of the United States? A man who is so petty he goes after people who he deems to be his enemy, like an imaginary friend of a 6-year-old?" "He certainly opened up the race wound from Charlottesville," he went on. "A man clearly wounded by the rational people who are abandoning him in droves ... A man backed into the corner, it seems, by circumstances beyond his control and beyond his understanding. "That's the truth," he concluded. "If you watched that speech as an American you had to be thinking, what in the world is going on?" What in the world is going on is a question many of us have been asking since November.